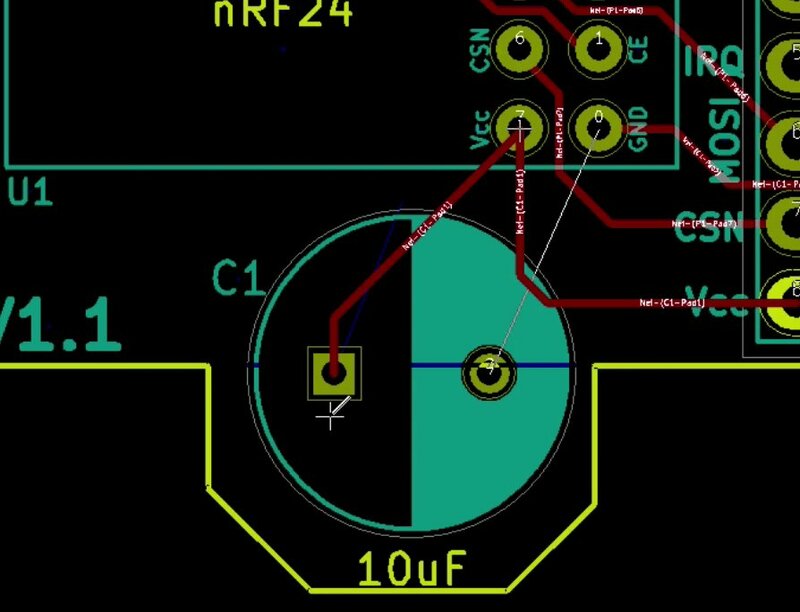 In this chapter, we will update the layout and wiring so that we can include the new capacitor in our design. 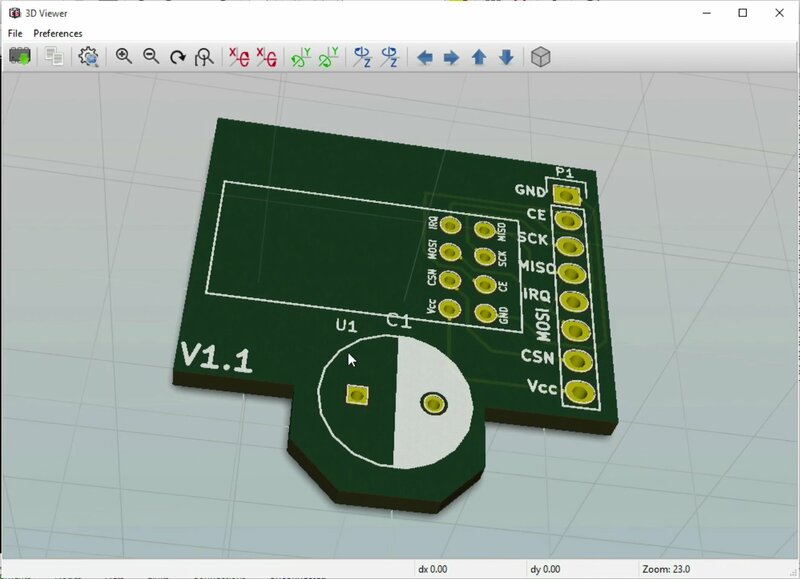 Before we forget, let’s change the version designator of the PCB to the new version designator which. Let’s make it version 1.1. Remember, you can edit the text label by placing the mouse cursor over it and hating the “E” key, which will bring up the properties window for the label. Next, let’s import the new netlist. Click on the netlist button, and browse to the location of the netlist file. The default settings are usually fine as they are. The Setlist file location should also be correct. This message seems a little strong worded, but it is nothing to worry about. Reading the netlist file is exactly what we want to do, so click on Yes. 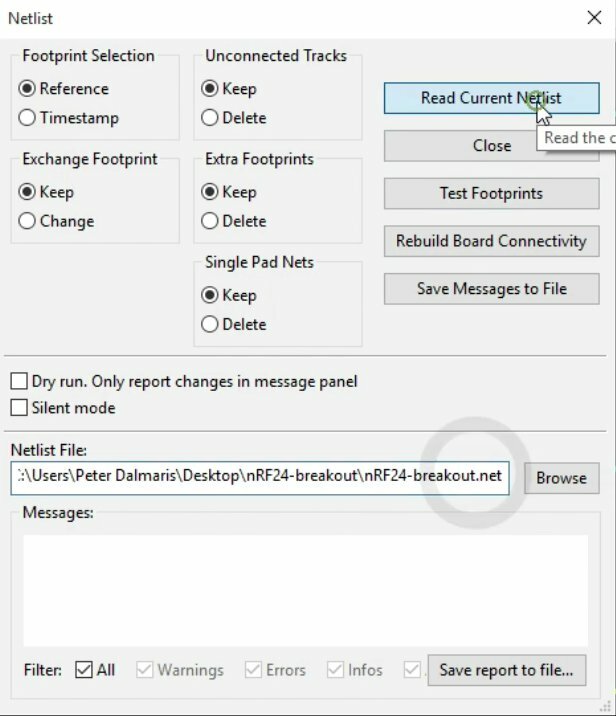 The Messages text box of the Netlist window contains confirmation that one new component was added to the canvas. The capacitor footprint is automatically placed below the existing board. We can now position the new footprint. 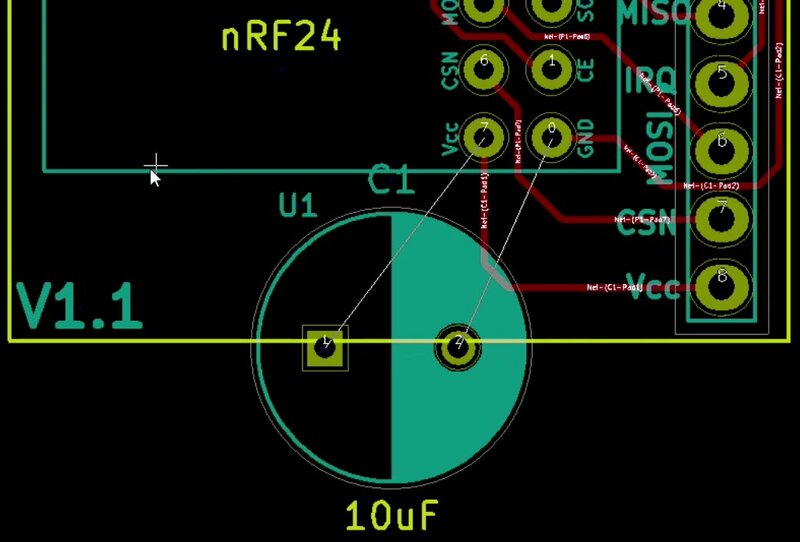 As a rule of thumb, we want to tracks from the capacitor pads to the VCC and ground pass to be as short as possible. 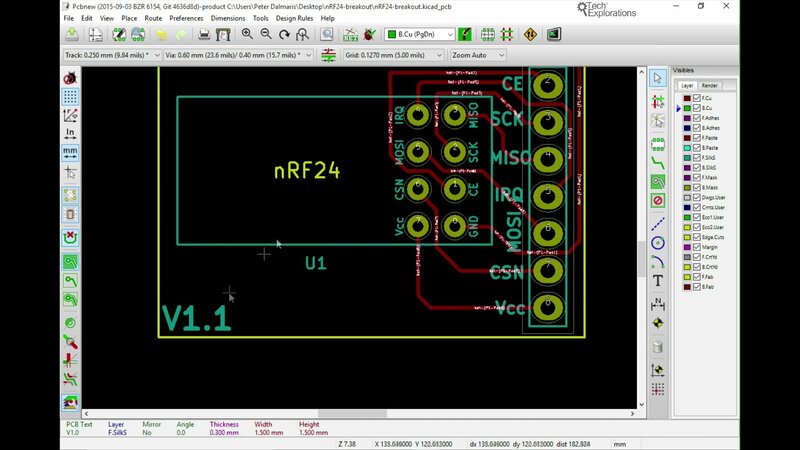 Based on that, we should position the capacitor just below the bottom of the nRF24 component. 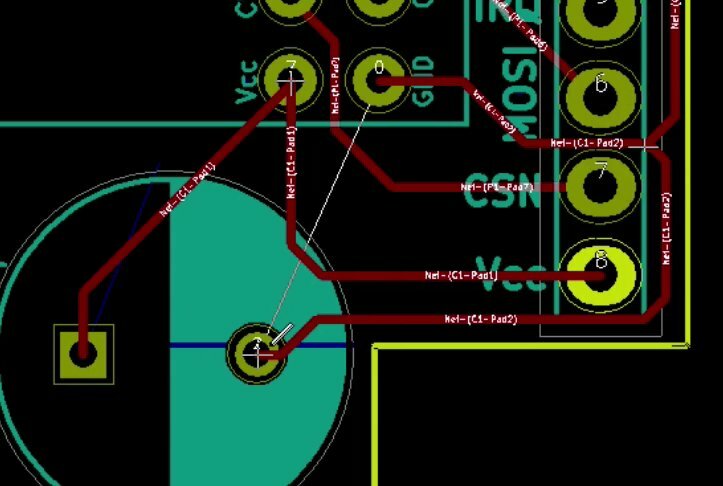 This position of the capacitor will allow us to draw short tracks to GND and Vcc. 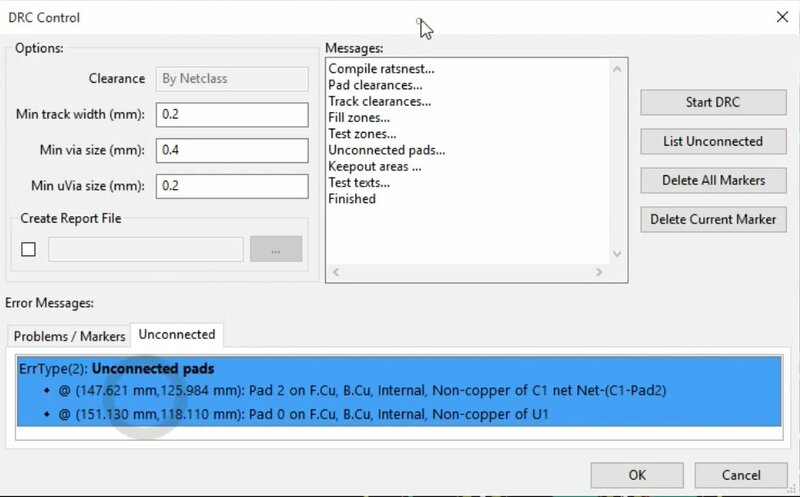 Notice the ratsnests indicating the pads that have to be connected. 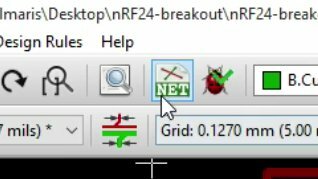 We should not try to place it any closer because we risk casing of the capacitor to be too close to the edge of the NRF module. This might make it to hard to actually mount the components on the board. You can see that the capacitor, especially its pads, are outside the edges of the existing board border. We will have to change the bottom border so that there is more room for the capacitor. Let’s update the edge cut next before we do the wiring. Select the edge cuts layer and delete the bottom part of the edge cut. To delete, click on the rubbish bin button. The bottom edge of the border has been deleted. The new border, going around the capacitor. I think it looks nice at least. You can improve on that of course, if you have a bit of patience you can make this look nice and rounded. In that case, I think this is good enough, so let’s check it out. A 3D view of the board. What does it look like now? It looks like this. A bit weird, but you can do interesting shapes in this way. You can also move the labels to locations that look more appropriate to you. Feel free to experiment with this. Let’s now work on the wiring. Switch back to the front copper layer and hit the X key. Connect the VCC to the positive pin of the capacitor. 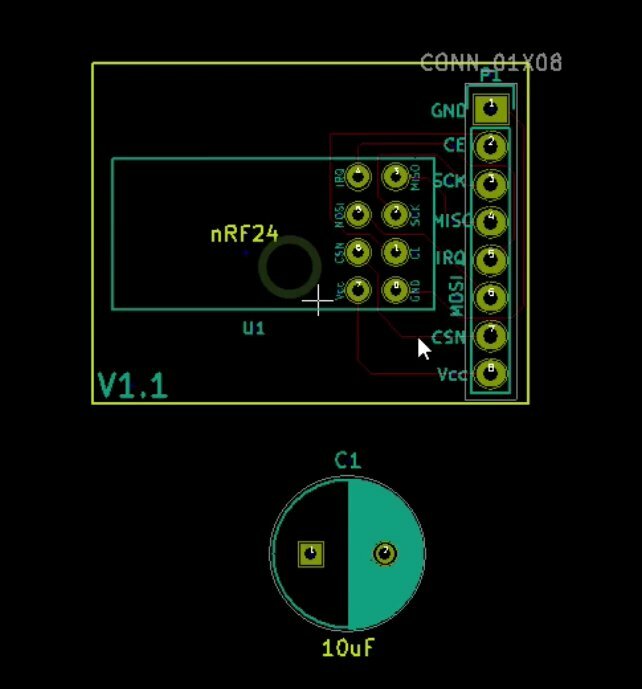 Connect the positive pad of the capacitor to the Vcc pad of the nRF24. Attempt to connect the negative pin of the capacitor with an existing ground wire. Notice that the ratnest line for the negative pin of the capacitor has not disappeared. This is even though we have done a connection between that pin and the existing GND wire. Why is that? Let’s do an ERC. 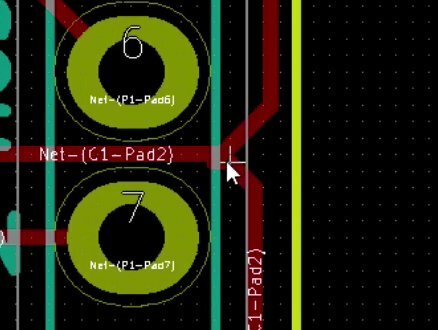 The ERC is telling us that the capacitor negative pad and GND are not actually connected, even though they look connected. Even though the new wire seems to be properly connected to the negative pad of the capacitor and to the GND wire, it may actually not be properly connected. So, in situations like this, it helps to double check connections, and often to redo them in order to fix such annoying problems. In my first attempt to connect the two wires, the connection was not successful. I had to try again to make it right. The process of wiring can be fiddly. Remember that you can always use the ERC check to make sure you haven’t forgotten anything even if it looks like it’s connected, sometimes it’s not really connected. 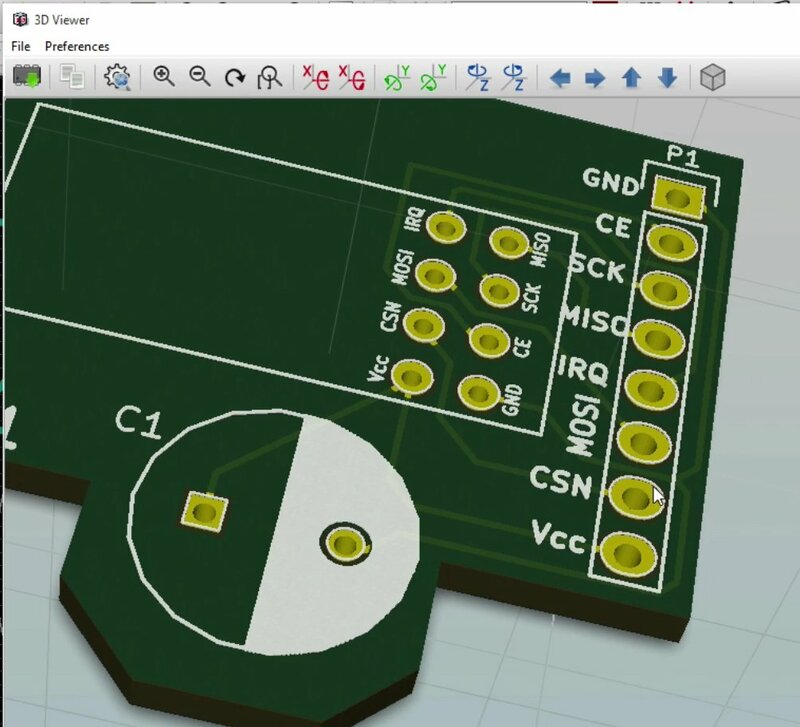 So, let’s have another look at the PCB and what it looks like now in 3D. The current 3D view of our board. You can see the capacitor and the new tracks. You can see the wires for the capacitor connected to the rest of the board. 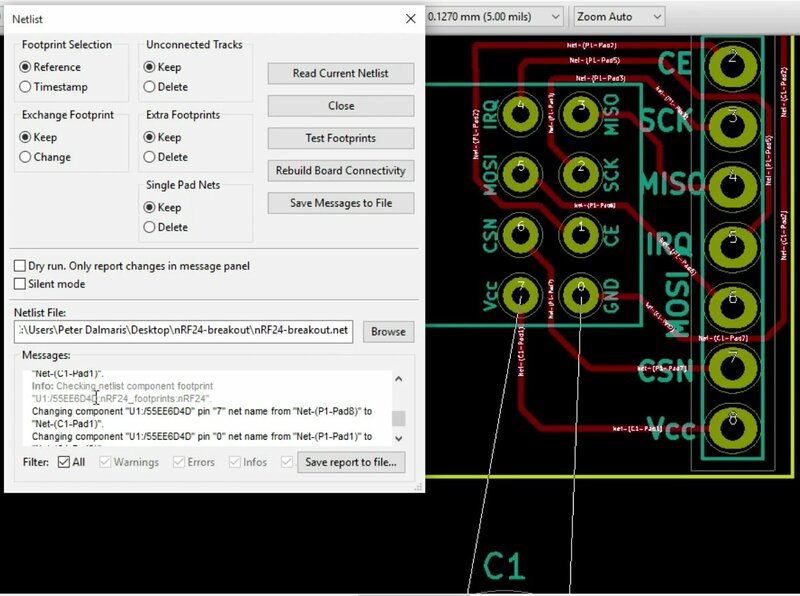 In the next lecture will look into improving some of the electrical characteristics of this PCB, and in particular, we’ll look at the issue of the track width and copper plates.